Ah …the smell of fresh-baked Apple Pie …straight out of the oven. The sweet aroma of baked apples and cinnamon in the air. What could be better! Crust: 1 package Betty Crocker pie crust mix. I was running short on time so I made life easier on this one and used the mix. Heat oven to 425 degrees F. Place one pie crust in ungreased 9″ glass pie plate. Press firmly against side and bottom. In large bowl, mix filling ingredients; spoon into crust lined pie plate. Top with second crust. Wrap excess top pie crust under bottom crust edge, pressing edges together to seal; flute. Cut slits or shapes in various places on top pie crust. You could also do the top pie crust in lattice shape. Bake 40 – 45 minutes or until apples are tender and crust is slightly golden brown. Note: You might want to cover your pie around edges with strips of foil after first 15 minutes to prevent too much browning on edges of pie crust. Cool at least 1 hour before serving. Top with your favorite Vanilla Ice Cream or Whip topping. 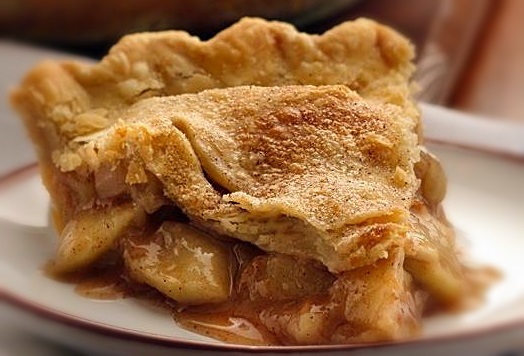 You can substitute 2 cans apple pie filling in place of the fresh apples to cut down on preparation time. For Caramel lovers: After removing pie from oven, drizzle with 1/3 cup caramel topping. You can use a gluten-free pie dough, I know Pillsbury makes one. Oh, I love apple pie. My favorite has the crumble top, like a Dutch Apple Pie. They are the best. I can smell it now…well, I can imagine I can smell it if there was one baking and I had not lost my sense of smell many years ago! Me too! Yes, I love the crumble top and I like the look of the criss cross lattice top my mom used to make. Omgoodness …is your theme recipes? Can’t wait! Thank you! I will have a lot of recipes in the challenge. Thanks so much for stopping by my blog! Previous Previous post: Yogurt Blueberry Pancakes – Fiesta Friday!